Every walk has moments of insight—fissures in the quotidian facade. One step, another step, a drone of steps. The crunch of earth under foot is like the shaman's drum. The drum beats and magic swirls with the wind. Dreams give us clues. In dreams one lifts off the ground when walking. Walking becomes floating. Floating turns to soaring. Waking up after a soaring dream is ever a disappointment, as if being awake were actually the dream instead. Back to our walk. On the trail, as we are rendered receptive, we start to truly see along the way. Each tree is a unique character in a forest tale, each bird an animated storyteller. Each and every thing becomes something unique and alive, yet all part of a sublime oneness. As we tire we yield ever more and that surrender brings a heady euphoria. Endorphins and oxygen. A walk might be as good as life gets. With most every walk there are trees. Most trees are part of the giant gestalt, the hike's backdrop—it is impossible to take in them all. Then, a startling and singular tree comes from nowhere. If you are lucky, it takes away your breath. It speaks to you, reminds you of some person in your life, or of a person who does not yet exist. If you have no schedule you might sit at the tree and sketch it. Or maybe talk to it. If you are a photographer, the tree is like the world's most gorgeous fashion model. You circle it and photograph it from every angle. When it is time to move on, you and tree exchange something ineffable. Two living beings sharing an eternal moment. I came across the tree in today's photo during a hike at Pt. Reyes National Seashore. Among the thousands of trees I saw that day, it was this tree that spoke to me. I only had a brief moment with it. It was bent and gnarled. The imprint of the elements were built into its every twist. 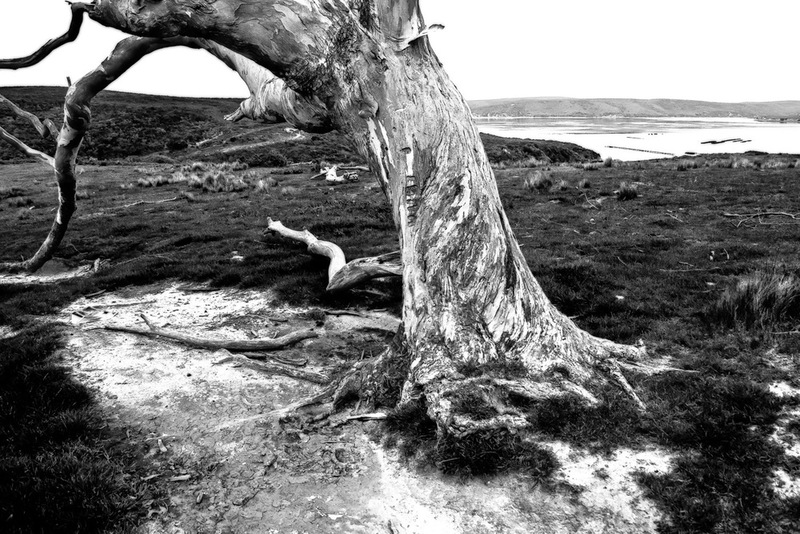 The tree's bluff was exposed to the ubiquitous wind and fog of Pt. Reyes. The tree seemed yielding to these elements but unbroken. Bent but resolved. The tree is now a dream in my memory, forever moody and alive.